The incredible artwork of Avatar: The Last Airbender! 184 pages feature exclusive concept art. Hundreds of images, most never released to the public! 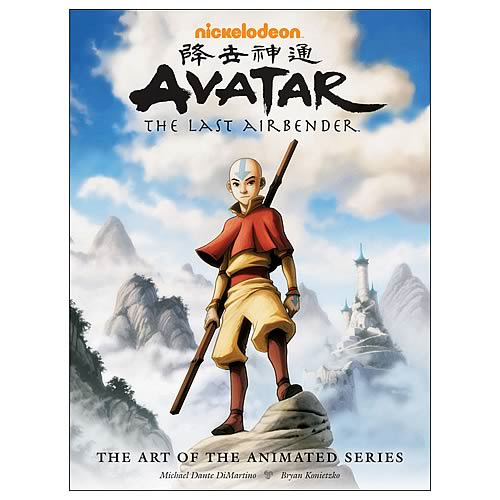 An unprecedented look at the concept, design, and production art behind this smash-hit series, Avatar: The Last Airbender - The Art of the Animated Series chronicles the show's development - from the very first sketch through to the series finale and beyond - along with behind-the-scenes commentary from series creators Bryan Konietzko and Michael Dante DiMartino. Its 184 amazing pages feature hundreds of images, most of which Nickelodeon has never released to the public! Since its debut in 2005, Avatar: The Last Airbender has remained one of Nickelodeon's most talked about and highest-rated animated series to date, and it's not hard to see why. Not only does it offer an epic storyline, engaging characters, action, adventure, and a powerful message about the importance of hope in a world long besieged by war, it also serves up top-notch entertainment. It's also beautifully executed, a stunning masterpiece of animated storytelling that harmonizes Western influences with aesthetic inspiration drawn from a diverse array of cultures, including those of China, Japan, India, and the Inuit.